I have undertaken a wide variety of commissions to date from my ranges. I have created pieces such as bonsai pots, cylinders and napkin rings inspired by the bark of the silver birch tree. In addition I have created many individual ornamental bowls; lighthouses to fit in with customers' interior colour-schemes; commemorative pieces for organisations as well as bespoke Green Men for gardens or interiors. I have a comprehensive portfolio of photographs to help you select ideas, shapes, colours and surface decoration and offer a bespoke service, for example I can incorporate your favourite leaves into your Green Man or perhaps inscribe your piece as desired. Please contact me by this form to discuss your requirements. My tel numbers are 01709 542507 or 07785505008. The penguin is lovely. It arrived this morning. They will be very pleased with it. Many thanks A.Horne, Knutsford, Cheshire. I met Caroline at a Thoresby Riding Hall Christmas Fair and was instantly taken with a sculpture of a Green Man's head she had created. Other than the obvious beauty and delicacy of her work I was charmed by her love of her subject, and distinctly gained the impression I was being interviewed as a suitable keeper of one of her sculptured pieces as much as I was being sold something she prized. I must have passed muster as a sale was struck, and we further agreed on a commission of 2 further heads as wedding presents for my daughter and her intended. The commission was a first for me and was to be the first matching male /female pair request for Caroline. The resulting sculptures are beautiful and will be a lasting momento of both an amazing day for my daughter and son-in-law:and for me as the day I became a patron of the Arts. True I may never threaten the Charles Saatchi's of this world, but I am equally sure that Caroline's talents will be taken up by serious collectors before too much longer. Buy now before the prices go up! Richard Johnson, Nottingham. Dear Caroline, Please find enclosed a cheque in payment for the Effingham Coat of Arms. On behalf of the Friends of Boston Castle and Parklands, I would like to thank you most sincerely for your hard work and dedication to the task. 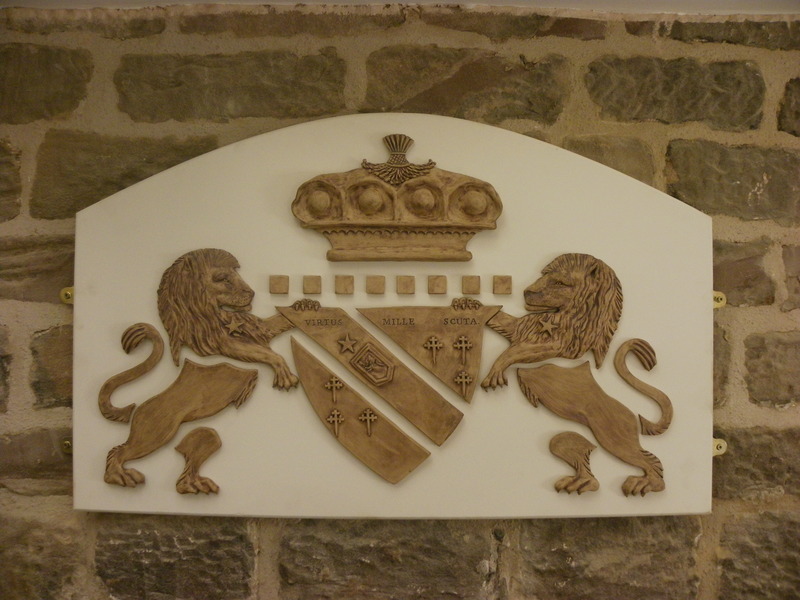 I am sure that the Coat of Arms will be admired by many visitors to Boston Castle and in every respect you have done justice to a modern version of the Coat of Arms by way of the beautiful ceramic work of art you have produced. Janet Worrall, Secretary of Boston Castle and Parklands. A much cherished and personal buying experience, more than happy to buy something else in the future. Richard E, Doncaster. My partner's 40th birthday was approaching and I wanted something both unique and that reflected his love of gardening. Caroline was so helpful with ideas and we decided to opt for a bespoke Green Man for the side of the house-I was not disappointed! Caroline created something amazing that my partner loved and that looks fantastic on our home. Peter Sanderson, Kilpin. 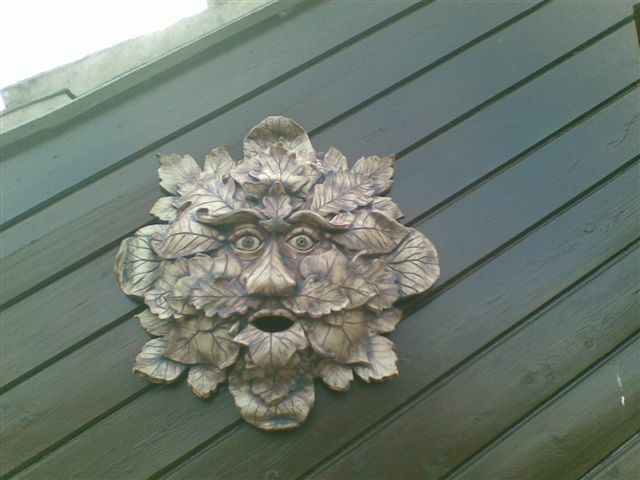 Large round green man set high up in the eaves of a customer's house in Kilpin, East Riding of Yorkshire. The Effingham Coat of Arms, commissioned by Friends of Boston Castle and Parklands. It hangs in Boston Castle Rotherham. © 2017 Caroline Lee Ceramics. Website by Christopher Lee.